All counties are completed. If you have any marriages to add to any of the pages, please email me. Also, I have added a page to add marriages of unknown locations. I am looking for marriages to add. I will add it to the appropriate page. Please send nothing copyrighted unless you have written permission from the author. I do not have the resources to do look-ups. Please refer to the North Dakota lookups! !!Volunteers!! are needed to make this project a success. 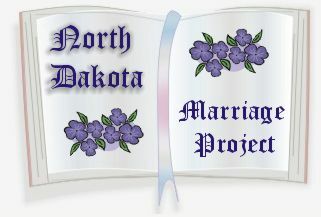 Please check out the State Marriage Page.